We would like to express our appreciation for your continued support to Shinjuku Yoyogi Citizen Monitoring Station. We inform you that our monitoring station is relocating. We are determined to making further efforts in order to be of help for you. We would like you to know how grateful we are for your additional guidance and cooperation with us. We will open our monitoring station on February 7 Thursday. We will operate our activities on the current residence until January 18 Friday. We will deal with new requests of monitoring and new inquiries from January 25, with e-mail on an individual basis. After our relocation, our activities are expected to fall into arrears, so it might take a longer time than usual to give you reports about results of measurements. 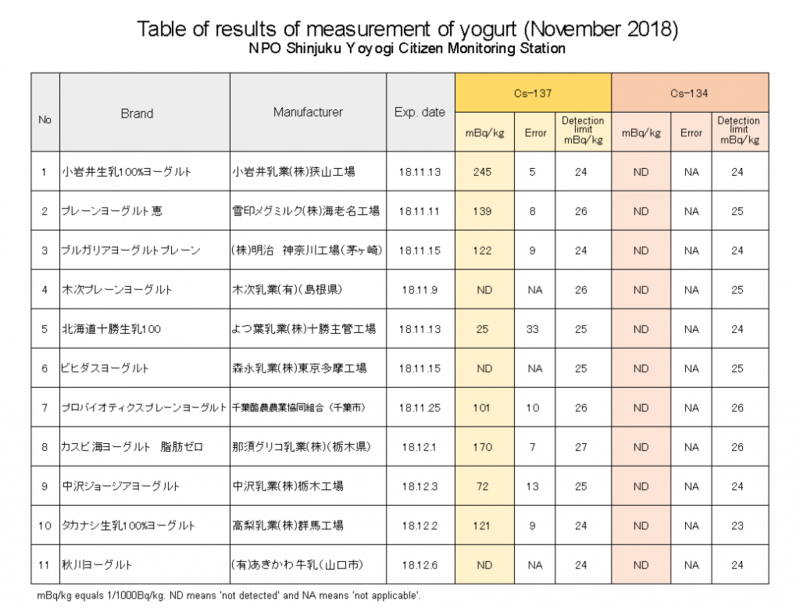 We monitored yogurts which are commercially available, in November this year. The add-up of the results is below.